How Just Were America’s Wars? To what degree were the wars waged by the United States ethically just? The answer is necessarily subjective, but would experts from across the political spectrum score conflicts in a similar fashion? In a survey of more than 100 international studies experts, the 18 major conflicts fought by the United States since 1900 were assessed. World War II was rated as the most just, whereas the Iraq Invasion was considered the most unjust. Respondents also scored each conflict under seven just war criteria: just cause, right intent, net benefit, legitimate authority, last resort, proportionality of means, and right conduct. 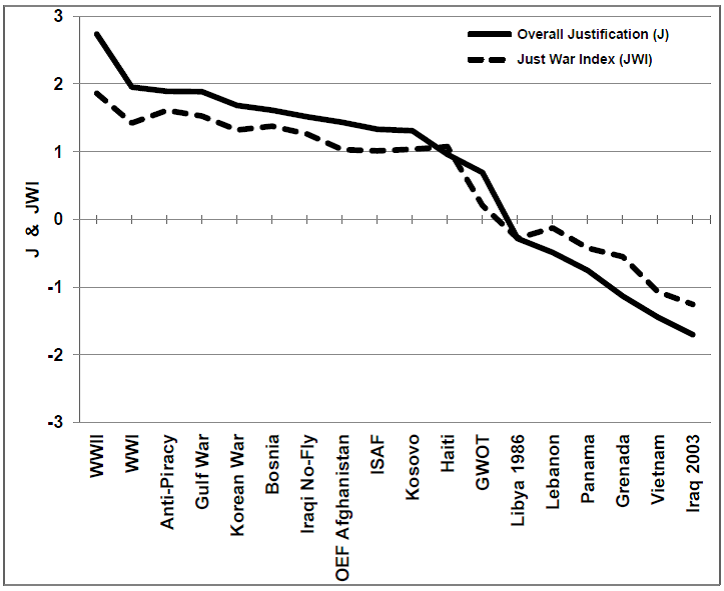 The average of the criteria, the “Just War Index” (JWI), correlated strongly with the participants’ measure of each conflict’s overall justness, indicating the importance of the criteria. Participants who identified themselves on the political right gave higher JWI values for almost all conflicts than those on the left. The left rated seven conflicts unjust while the right found all to be just, though three only slightly so. Nonetheless, the ranking of conflicts was quite similar between the two groups. Though no conflict was deemed completely just or unjust, the US war spectrum ranged from highly “just” to highly “unjust.” The JWI approach offers a quantified and nuanced analysis of important ethical criteria—an approach that could be applied to other conflicts, including future ones. Decisions on whether to go to war or to use armed force are among the most important that any state can make. Such decisions have a strong ethical component since they are literally matters of life and death. Over the centuries, Western theologians, philosophers, lawyers, and practitioners have developed the just war tradition to identify key ethical questions to consider before engaging in violence. Though just war theory is not a uniform concept with a single source or one definitive statement, its basic tenets are widely accepted and have even become a part of international law and discourse (Gardam 1993; Falk 2004; Obama 2009). Why use force? A just war requires: (i) a just cause; (ii) the right intent; and (iii) a net benefit. Who should authorize force? (iv) A legitimate authority. When can force be used? (v) As a last resort. What level of force? (vi) Proportional means of force. How and where to apply force? (vii) Using right conduct, including the distinction of military targets from civilian ones. Each of the seven criteria is defined in Table 1, based on a review of definitions provided by two prominent contemporary thinkers on the just war tradition (Johnson 1999:28–29; Walzer 2000). Additional criteria are sometime cited in the just war literature but these were not explicitly included in this study because they are largely covered by one or more of the seven criteria or overlap significantly with them. For instance, having the aim of peace can be considered a part of the just cause criterion. Similarly, the criterion of reasonable hope of success is inherent in the need for a net benefit: a conflict waged unsuccessfully would not have a substantial net benefit.2 Also military necessity is quite similar to last resort, since if peaceful means exist, they must be tried first before military force becomes necessary. Furthermore, in practice, military necessity usually focuses on the tactical and operational actions of soldiers within war and it can be regarded as part of right conduct. Writings on just war (bellum justum) commonly divide the criteria into those dealing with the recourse to war (ad bellum) and those applied to conduct during war (in bello). Typically, the first five of the seven criteria used here are included in the ad bellum list while the last two appear in the in bello set. Though proportionality of means could be included as part of right conduct, it is separated out given the strategic aspect of the concept and its central position in international humanitarian law.3 The broad yet more tactical criterion of right conduct includes important sub-criteria, such as abiding by the laws of armed conflict, including non-targeting of civilians. Some scholars have also examined the idea of justness after war (terming it jus post bellum) as a modern addition to the just war tradition (Stahn and Kleffner 2008). The participants in this study likely considered the post-conflict situation in their assessments, especially to evaluate the net benefit, since the evaluations are done ex post facto, that is, after the war/conflict has ended (or nearly so). The scaled measurement of the just war criteria encourages a nuanced analysis, while still allowing for overall pronouncements of a conflict as just or unjust to a specified degree. The just war scale is an additional technique in the ethical toolkit for the evaluation of conflicts. Absolutist or “black or white” assessments tend to lack nuance or a sense of scale and collapse the scope of debate. This can reduce the understanding of complex conflicts and limit the avenues for effective conflict resolution. The objective of the present study is to determine how experts view the justness of the wars and major combat operations of the United States since 1900. They were asked to give, in a single assessment, an overall justness score (J) for each conflict. They also applied the seven just war criteria to each conflict. A composite index of the seven criteria was formed by taking the mean of the seven scores. This measure is termed the Just War Index (JWI), which was compared with J. As the political orientation of each participant may influence their evaluations, we also explored how experts across the political spectrum—on both the right and left6—are similar and different in evaluating these conflict cases. Respondents were selected on the basis of being publically identified subject-area experts on issues related to war, peace, political violence, or international affairs more broadly. Given the nature of this work, the individuals contacted were doctorate holders, principally university professors, chosen primarily from the membership list of the International Studies Association. All respondents completed the survey anonymously. With only minor exceptions, the individuals were located in North America and the United Kingdom. Approximately 1,000 surveys were distributed via electronic and paper versions. One hundred and thirty-two surveys were returned. The response rate of approximately 13% was reasonable given that the survey was long, asking respondents for 277 responses across 12 pages. Of the surveys returned, 23 were excluded from the analysis because the respondents had completed less than 50% of the survey or did not provide demographic information, including the information on political orientation that is central to this study.7 The final sample consisted of 109 respondents. Respondents were asked to evaluate the use of force in the wars and major conflicts fought by America since 1900 as listed chronologically in Table 2.8 They were asked “to evaluate the levels of ethical justification for armed conflicts in which American forces fought.”9 After orienting respondents to the aim of the study, they were presented with the first seven sections of the survey, which dealt with each of the just war criteria in turn. To control for possible order effects, a random order of the seven criteria was first drawn and then seven orders were constructed using a Latin square design, which were then distributed in equal numbers during recruitment. Not all respondents rated all the criteria which explains the variation in average number of respondents by conflict across the seven criteria in Table 2. For each conflict, respondents were asked to indicate the extent to which they agreed or disagreed that America had met the specific just war criterion in the named war or conflict. For example, with the just cause criterion, they were asked “To what extent do you agree or disagree that the United States had just cause to use armed force in the following conflicts?” Respondents provided a response on a seven-point Likert scale ranging from 3 (strongly disagree) through 0 (neutral) to +3 (strongly agree), with intermediate levels anchored with the terms moderately for values of 2 and slightly for values of 1. This type of bidirectional measure is commonly used in psychometric analyses of the central tendency of, and variation in, people’s attitudinal responses. Respondents were also given the option of indicating that they were unfamiliar with the conflict. The JWI score was computed for each conflict by taking the average of the seven just war criteria ratings for that conflict for each respondent. Thus, the average JWI score across respondents provides an evaluation of the perceived justness of that conflict for the present sample of experts. After evaluating the seven just war criteria for each conflict, respondents were also asked to rate each of the 18 US conflicts in terms of overall justness. Specifically, respondents were asked “To what extent do you agree or disagree that the use of armed force by the United States was justified overall in the following conflicts.” These “J” ratings were made on the same seven-point scale used in the preceding sections, and respondents were once again given the option of indicating whether they were unfamiliar with a given conflict. Thus, whereas JWI represents an aggregated componential view of a conflict’s justness, J represents a global assessment of a conflict’s justness. A key objective was to examine how these two measures track one another. The expert evaluations of US conflicts are shown in Figure 1. The order (left to right on the X-axis) is from most-to-least just according to the J values, the single assessment of overall justness for each conflict; the JWI (composite of seven criteria) is also provided in Figure 1. The high degree of correspondence between J and JWI is evident in Figure 1. The averages over all participants of J and JWI were strongly correlated (r = .99) across the set of 18 conflicts. Thus, in the aggregate, the composite index based on the seven indicators tracks the overall level of justness evaluated by experts. Moreover, across the conflicts, the mean J and JWI scores were close in value, showing very similar assessments of justness. Furthermore, the same conflicts were evaluated as negative (“unjust”) in both J (direct evaluations) and JWI. Looking over the conflicts chronologically, there is no discernible improvement in J and JWI over time: there is no clear trend toward more or less just wars and no evidence of a learning process, though this may also reflect that standards of judgment are stricter for later conflicts. World War II was considered the most just while the Iraq Invasion of 2003 was judged as the least just. There was, however, an apparent low period for conflicts in the 1960s (Vietnam) and 1980s (Grenada, Lebanon, Libya 1986, and Panama). The complete set of scores for the seven criteria for each of the 18 conflicts is provided in Table 3 along with the J and JWI scores. A detailed look at the criteria provides some insights into the conflicts and allows scope for interpretation of the scores. It also allows for an overall assessment: averaging over all the US conflicts, the J and JWI (0.73 and 0.61) show the US engagement in wars to be slightly just overall as measured by our sample. Averaging across all conflicts, the seven criteria have moderately different values: the highest-scored criterion was legitimate authority (+1.07). Perhaps the participants viewed US military forces as always acting under presidential authority if not with Congressional or UN Security Council authorization. The lowest scoring criterion was net benefit (+0.28) illustrating that wars produce very mixed results. Further examining the scores in Table 3 for each of the seven just war criteria, the highest and lowest ranking conflicts are shown in Table 4. Four conflicts predominate in Table 4. World War II received the highest scores for five criteria. Given that the fight against Nazi Germany and Imperial Japan was one for survival as well as for international peace and security, this is not surprising. Only two criteria (proportionality of means and right conduct) are higher for another conflict: the Anti-Piracy mission off the coast of Somalia. The low-intensity mission requires little firepower and results in low numbers of fatalities even among the pirates. Given that it occurs on the high seas, collateral damage is unlikely, except perhaps to the hostages themselves, and forceful actions occur in areas far from shore where reporting is scarce. Furthermore, piracy is widely seen as an appalling crime, involving the repugnant hostages-taking for ransom, a practice more characteristic of a previous age. Thus, high scores are not surprising. Of the lowest ranked conflicts, the 2003 Iraq Invasion and the Vietnam War are comparable: the net benefit of the Vietnam War was considered the most negative of all conflicts, possibly due to the loss of South Vietnam after the war. Conversely, the 2003 Iraq Invasion had the next lowest score for both last resort and just cause, in all likelihood because the Bush administration pushed to invade the country pre-emptively based on the presumed presence of weapons of mass destruction (WMD) in Iraq, which were not found after the war. For legitimate authority, an interpretation comes from clear evidence: conflicts ranked in the lower half lacked a UN mandate from a Security Council resolution, while those with scores in the top half almost all had such authorization, excluding wars fought before the United Nations was created. As shown in Table 5, for a middle-ranked conflict such as OEF–Afghanistan, there was no explicit authorization, though the Security Council did acknowledge its presence in a 2003 resolution requesting ISAF to cooperate with OEF (United Nations Security Council 2003; Dorn 2011). From the results over the 18 conflicts, it appears that authorization by the US Congress was not as important in the determination of legitimate authorization. Although the top-scored conflicts did receive congressional authorization, most of the lower-scored conflicts did as well. For example, the 2003 Iraq Invasion was congressionally authorized but it ranked at the bottom of the list in legitimate authority. Taken together, these findings suggest that to be perceived as legitimate, entry into a conflict requires authorization from a body independent of the conflict participant. Possibly, since the US Congress serves American interests, it might be regarded as in a conflict of interest. Legitimacy, for experts in our study, seems to require agreement by other nations or bodies in the international community, especially the UN Security Council. Security Council? Authorization by US Congress? * Full sources and detailed references available on request. † The Korean War is notable in that Congress never sanctioned or openly stated its support for the war but funding was appropriated (Elsea and Grimmett 2011). ‡ Following Gulf War I in 1991, the United States proclaimed no-fly zones over North and South Iraq to protect Kurdish and Shiite populations. This was done lacking clear Security Council authorization, but the United States claimed it was “acting in support” of Security Council Resolution 688 (1991). The no-fly zones were not condemned by the Security Council or the General Assembly (Gray 2004:34–37). § United Nations Security Council Resolution 1368 of September 12, 2001 recognized “the inherent right of self-defence” but did not mention Afghanistan or invoke the UN Charter’s Chapter VII to authorize use of force (United Nations Security Council 2001). ¶ The United States claimed that UN Security Council Resolution 1441 (2002), which declared Iraq in “material breach” of Resolution 687 (1991), was sufficient authorization (Prados 2003:2; Gray 2004:272). Even as World War II dominated in nearly every criterion, for right conduct it ranked only 12th out of the 18 American conflicts. Possibly the heavy use of fire bombing on cities and the dropping of two atomic bombs in World War II reduced the values for right conduct as well as for proportionality of means. The Korean War also had a low score (0.51) for right conduct, which is quite low in comparison with the high marks this conflict received for all other criteria (average of 1.46 excluding right conduct). This may be due to the conduct of General Douglas MacArthur, who was dismissed by President Harry Truman for risking a Third World War. Conversely, the conduct of American forces in Haiti in 1994 was ranked remarkably high (second of all conflicts) in comparison with the generally low results for the other six criteria the conflict received (average of 10th out of 18). In 1994, the naval and aerial show of force near Haiti was enough to cause the junta to step down and accept exile without necessitating combat. Since little force was used, there is little to criticize in the conduct of the operation. An anomaly appears for the net benefit of the bombing of 1999 Kosovo—which ranks 4th of all conflicts—although it is ranked half-way down otherwise for the other criteria. This may be due to the perceived benefit of avoiding another massacre like the 1995 Srebrenica slaughter, even as the NATO aerial bombardment caused extensive damage in both Kosovo and Serbia. The Iraq No-Fly Zone (1991–2003) stands out as having a wide range of scores, from a third-ranked proportionality of means to a right intent ranked at tenth. This may reflect the complexity of the mission and the uncertain results; it demonstrates the nuanced nature of the use of force. In the JWI model, the averaging over the seven criteria could potentially lead to a positive JWI (that is, the conflict is just overall to some degree) even when one or two criteria are highly negative. This form of compensation could be misleading in some theoretical cases. For example, if genocide were used as a method, one would be hard pressed to conclude that a conflict was just overall, even if the other criteria were positive. In our data, there is no such case where the JWI is positive but one or more criteria are highly negative (for example, under 1). In fact, the only US conflict where the JWI is positive and any other criteria are negative (only moderately) is Global War on Terror (GWOT): JWI of 0.2 but a net benefit of -0.26, a proportionality of -0.39, and a right conduct score of -0.56. The JWI model could potentially be modified so that one strongly negative criterion could neutralize the justness of an otherwise positive assessment. At the least, any highly negative criterion should be highlighted in an analysis of the results. The US actions against Iraq in 1991 and 2003 show how criteria tend to be uniformly positive or uniformly negative. The contrast between the 1991 Gulf War and the 2003 Iraq Invasion is particularly instructive to demonstrate the value of a JWI analysis of the criteria. Though the conflicts were similar in many ways, the two sets of scores are in stark contrast. The Gulf War received a JWI of 1.52, ranking it as third out of 18 conflicts on this measure. By contrast, the Iraq Invasion ranks at the bottom of all conflicts with a JWI of -1.25, even lower than the Vietnam War. The criteria provide an excellent framework to compare possible reasons for the large discrepancies between the ways the two conflicts are viewed. The cause for the 1991 Gulf War was clear: to expel Iraqi military forces from Kuwait, which they had invaded six months earlier, and return Kuwait to sovereign control as an independent member state of the United Nations. Overall, the Gulf War ranked second on the just cause criterion, behind only World War II. By contrast, the Iraq Invasion was ranked at the bottom of the 18 conflicts for just cause. The main declared cause was much more dubious: to eliminate a potential threat from WMD, presumed to be in the arsenal of Iraqi dictator Saddam Hussein. However, no such weapons were found and it was discovered that US intelligence estimates had been slanted or even falsified to accommodate political pressures. In the Gulf War, the intent behind the use of force was openly declared: to reverse Hussein’s invasion of Kuwait and to remove his control over the productive Kuwaiti oil fields (Bush 1990). Given that the war was halted when these objectives were met, the use of force, according to our sample of experts, met the intent criterion (scored 1.61). In the Iraq Invasion, the intent was mixed and appeared to change with the situation on the ground: from WMD removal to dealing with terrorists to “finishing the job” started in the Gulf War—that is, removing Saddam Hussein from power. Considerable doubt remains that the main declared cause, WMD removal, was the driving motivation behind the invasion. On this criterion, the Iraq Invasion was ranked by far the lowest of all US conflicts with a score of 1.34. The net benefit of the 1991 Gulf War was that Kuwait regained control of its territory, achieving the status quo ante bellum. For the Iraq Invasion, the net benefit was not so clear: a dictator was toppled but Iraq lost more than a hundred thousand people in the war and the ensuing insurgency while the United States lost more than 4,400 of its troops. Iraq experienced an enormous surge in terrorism and major ethnic divisions propelled what amounted to ethnic cleansing (Agnew et al. 2008). After the invasion and elections, there were violent power struggles, with Shiites gaining power and thereby increasing the influence of neighboring Shiite-ruled Iran; Sunnis lost power and the Kurds carved out their own domain in the North, leaving no strong or effective central government over all of Iraq. The experts ranked the Iraq Invasion above only one conflict (the Vietnam War) in net benefit. The legitimate authority for the 1991 Gulf War was clear: the UN Security Council and the US Congress both authorized the US-led coalition, which included a large number of partner-nations contributing meaningfully to the use of force. The operation had gained clear support in the international community, including from the Soviet Union, the former Cold War foe of the United States. In legitimate authority, the Gulf War ranked only behind World War II of all conflicts considered (score: 2.18). For the Iraq Invasion, there was no Security Council mandate because the United States decided at the last moment not to submit the matter to a vote. It was clear that a resolution for an invasion would be vetoed by China, France, and Russia and that it would not even win the nine positive votes needed to pass. Despite the fact that the US Congress did sanction the war, it was ranked in last place for this criterion (score 0.64). The Iraq Invasion was not fought as a last resort since the threat of WMD attack was not imminent. By contrast, in 1991, Iraq was solidifying its hold on Kuwait month-by-month after the August 1990 invasion. Sanctions did not induce Iraq to back down, so the 1991 coalition attack was widely seen as a war of last resort. Of all conflicts, the Gulf War ranked second overall for this criterion; in contrast, the Iraq Invasion was ranked in 18th and final place. In 1991, President George H.W. Bush stopped short of invading Iraq but still applied sufficient force to achieve the declared aim, thereby maintaining proportionality of means. In 2003, this criterion was not met. To deal with a debatable WMD threat, many wondered if a full-scale invasion was proportionate and if regime change was necessary (Enemark and Michaelsen 2005). Invasion and overthrow are among the strongest measures that can be taken against a nation. For the criterion of last resort, the Iraq Invasion was ranked second last, with only the Vietnam War below it. Right conduct in the Iraq Invasion and subsequent occupation of Iraq was tarnished by several actions of the US military, including the Abu Ghraib prison abuses, the Fallujah offensive, and the Haditha killings. In addition, US military contractors such as Blackwater committed much-publicized atrocities (for example, the “Nisour Square” massacre). In the 1991 Gulf War, reports of such cases were few, and treatment of prisoners of war was seen as broadly consistent with the Geneva Conventions and International Humanitarian Law, although the attack on departing Iraqi forces along the “highway of death” was widely condemned. The Gulf War ranked as third overall in right conduct. Only the Vietnam War ranks below the Iraq Invasion. The stark contrast between the missions is reflected in the scores for every criterion. All Gulf War scores are positive, and all Iraq Invasion scores are negative: the difference between them being quite large, varying from 2.07 to 3.62 among the seven criteria (out of a six-point maximum spread). The low evaluation of the Iraq invasion was common to a large number of respondents in various groupings. Examining the effects of political orientation on respondents’ war evaluations was a key objective of this study and yielded intriguing results. For simplicity and clarity, the five possible political options for respondents were distilled into two groups: “left” (those who self-identified as left and center left) and “right” (those who self-identified as center right and right). Those who indicated the “center” position on the survey are not included at this point in order to simplify the analysis. 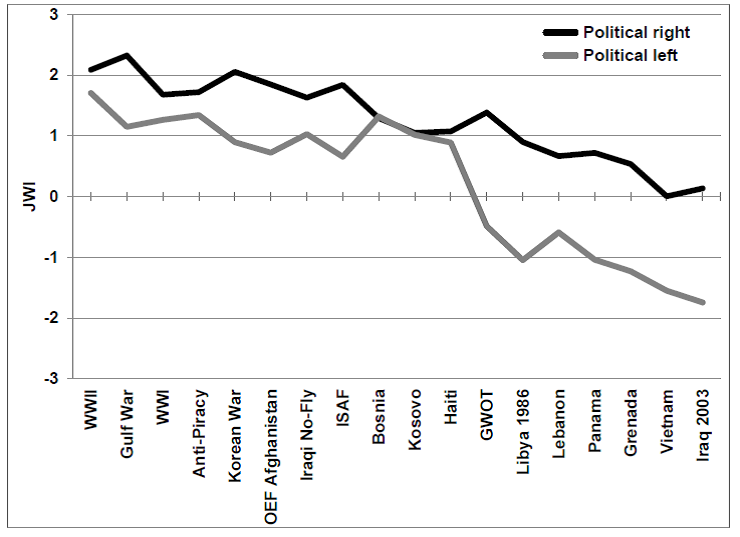 The political right evaluated the US conflicts as considerably more justified than the left. They gave higher J scores for all conflicts, with the exceptions of Bosnia, Haiti, and Kosovo where the variations from the left were small. For the right, the average J score for all conflicts was +1.59 versus +0.29 for the left (again, on the 3 to +3 scale). The right evaluated all 18 US wars as positive (above zero), which can be broadly interpreted as a finding of perceived justness (to some degree) across all conflicts. By contrast, the political left evaluated seven of 18 conflicts as unjust, again to some degree. Furthermore, evaluations from the left show a much larger range between the most and least just conflicts (range of 5.06 versus 3.09 for the right). The conflicts on which the left and right disagreed most (more than a two-point difference on the seven-point scale) are shown in Table 6. Interestingly, yet unsurprisingly, this table reads like a list of the most divisive conflicts in American society over the last 50 years. Although the right evaluates conflicts higher (more just) than the left in nearly all cases, it is significant that the ranking of wars was similar for both. In fact, the correlation between the J values for the left and right was quite high (r = .82) and, naturally, the correlation between rank order was also high (r = .79). The conflicts are listed by rank in Table 7 for the two sides. Splitting apart the rank data on political orientation reveals other remarkable similarities between the left and the right. For example, the left ranked World War II as the most justified and the 2003 Iraq Invasion as the least justified. The right agreed on World War II and only reversed the position of Iraq and Vietnam at the bottom of the list. Some larger differences are apparent: the right placed World War I and NATO’s Bosnia actions further down in rank and the GWOT higher in rank. Overall, however, the similar rank order of conflicts suggests that although the left and right have disagreed on whether a given war was just or unjust, on the whole the two sides of the political spectrum agreed on the justness of the wars relative to other wars. While the scores differed considerably on an absolute scale, the rank order was remarkably similar. Much like J rankings, the political right ranked conflicts by JWI as more “just” in almost all cases; a single instance—that of Bosnia—did not conform to this dominant trend, albeit to a minor extent. Figure 2 compares visually the JWI scores for the political right and left. The JWI scores of the 24 respondents who self-identified themselves in the political center were almost always in between the JWI scores of respondents from the left and the right. In only two of the 18 conflicts did the political center fall outside: in Bosnia, it was slightly more positive (1.59) than both the left and the right, which scored the conflict closely (1.32 and 1.30, respectively); and in the Anti-Piracy operations, where the center was more considerably positive (at 2.16) than both the left (1.34) and right (1.72). That was the only unexpected (and still unexplained) result for the political center. Looking at specific criteria, there are only a few cases where experts on the political left ranked any criterion lower than those on the political right. The two Balkan interventions (NATO Bombing in Bosnia in 1995 and the 1999 Kosovo Bombing) are such cases. These rankings are possibly motivated by the dire humanitarian situations in those conflicts. Humanitarian concerns are generally thought to be more motivating to the political left. GWOT, Global War on Terror; ISAF, International Security Assistance Force; OEF, Operation Enduring Freedom. Similarly, the fact that the right did not view any of the 18 wars as unjust (that is, gave all positive JWI) may have been influenced by several factors. The first is conformity and respect for authority, which Schwartz (1992, 1994) has found to be more pronounced on the right than the left. The right tends to pay more respect to national authority, in addition to placing more emphasis on national security. Given that all the US wars were launched under the authority of US presidents (and almost always with congressional blessing, see Table 5), the right might be less willing to challenge the decisions, including those on waging war, considered unjust by the left. The left is more open to the questioning of national authority. Supporting this assertion, the results show that, averaging over all 18 conflicts, the left scored legitimate authority 0.89 points lower than the right. For the conflicts the left considered unjust, the difference in legitimate authority score from the right was even larger: 1.56 points. A related factor may be the party of the president: since the left and right tend to associate with the Democratic and Republican Parties, respectively, they might favor conflicts waged by presidents of their party, as suggest by Berinsky (2007). Buttressing this hypothesis, all seven wars deemed unjust by the left were led by Republican presidents, except Vietnam. The latter was dramatically escalated under Democrat Lyndon Johnson, who was on the anti-Communist “right” of the Democratic Party on foreign policy issues, though the war was continued (and ended) by Richard Nixon, a Republican. On the other hand, there is a counter example: the war perceived as second most just overall (the Gulf War) was led by President George H.W. Bush, a Republican. It gained considerable support from the left, as well as the right. Another possible factor, as mentioned above, is that the left likely places more importance on universal human values (for example, humanitarianism and human rights) while the right emphasizes national security. The seven conflicts seen as “unjust” by the left had a much higher emphasis on national security than on humanitarian concern for a foreign population. In the seven cases, the main causes for US warfighting were to remove dictators, communists, and terrorists, all of whom were perceived to threaten the United States or its allies. This study shows that it is both possible and useful to evaluate the justness of a specific conflict on a spectrum rather than simply in a binary fashion. Simply put, a given war is not merely just or unjust: the answer is a matter of degree. The introduction of the J and JWI spectra, which allow for absolutes in rare cases, suggests that evaluations of war include many trade-offs. There are a number of unique but related ethical criteria that need to be considered, with the just war tradition offering a particularly useful set. The scoring of the criteria proved useful in making comparisons between selected conflicts, as shown for the Gulf War and the Iraq Invasion example. The JWI model exhibits great flexibility and can be used to analyze nontraditional warfare or conflicts like GWOT. All the same criteria need to be considered whenever armed force is used, though the ways the criteria are considered may vary greatly depending on context. The more recent the conflict, the greater the chance that opinions may shift over time. For instance, the most recent conflict in the survey is the Anti-Piracy mission off the coast of Somalia, where bad press or civilian deaths could potentially cause the high assessments to decline. Except for the Anti-Piracy mission, the conflicts have now ended. For the vast majority of the conflicts, the historical basis is now well established; the data should hold up over time. The JWI, as a composite index (average of seven just war criteria), gives a good sense of the ethical justification of a conflict based on the key ethical considerations. The correlation between J and JWI provides strong evidence that the traditional just war criteria are important components in the overall estimation of the justness of wars. But there are potential drawbacks to the JWI concept. In calculating JWI, the criteria are weighted equally. A deeper statistical analysis may show that some criteria are more important in determining the overall justness (for example, just cause being more important than legitimate authority). Further work is currently being undertaken by the authors to look at weighting the criteria. The study also shows that quantitative evaluation of the justness of wars can be done by expert survey. While this is only one segment of the population, their views might be particularly insightful and influential, at least in providing historical perspective. Our disaggregation by political identity further indicates that the model has value for analysis of viewpoints at the subgroup level. Work is also being done to look at other segments of the population. Perhaps the most remarkable results were the differences and similarities between respondents from the left and right of the political spectrum. The right views all 18 US wars/conflicts as just, while the left sees 11 as just and seven as unjust. Those seven conflicts are among the most controversial in recent US history: Iraq 2003, Vietnam, Grenada, Panama, Lebanon 1983, Libya 1986, and GWOT. However, while the two groups diverge in their quantitative evaluations, they agree remarkably closely on the ranking of the conflicts. The most just conflict for both left and right was World War II. The least just conflicts for both sides were: Iraq 2003, Vietnam, Grenada, and Panama. So the difference between left and right is more a question of where the threshold for justness is placed. For instance, if only JWI scores above 1.0 are considered truly just, then the political right (see Figure 2) would not include six conflicts as justified, instead of considering all the conflicts just. The authors make no claim about which JWI levels would be appropriate to license conflict. Given the importance of decisions about war, it is vital to perform a critical analysis of the pros and cons, with the just war tradition offering a valuable analytical framework. The issues are complex, even if the answer is clear—either a just or unjust war to a specific degree. The quantitative just war analysis has shown how conflict-specific assessments can be made by individuals using a stable set of ethical criteria. These related closely to their perceptions of the overall justness of those conflicts. This kind of analysis, using the JWI, can offer a way to measure and analyze the justness of war as a complex, multidimensional construct. It can help produce decision-making criteria to inform important ethical responses in future conflicts. AGNEW, JOHN, THOMAS W. GILLESPIE, JORGE GONZALEZ, AND BRIAN MIN. (2008) Baghdad Nights: Evaluating the US Military “Surge” Using Nighttime Light Signatures. Environment and Planning A 40: 2285– 2295. ASMUS, RONALD, PHILIP P. EVERTS, AND PIERANGELO ISERNIA. (2004) Power, War, and Public Opinion. Policy Review 123 (February-March): 73–88. BELLAMY, ALEX J. (2006) Just Wars: From Cicero to Iraq. Cambridge, UK: Polity. BERINSKY, ADAM J. (2007) Assuming the Costs of War: Events, Elites, and American Public Support for Military Conflict. Journal of Politics 69: 975–997. BERINSKY, ADAM J. (2009) In Time of War: Understanding American Public Opinion from World War II to Iraq. Chicago: University of Chicago Press. BLANK, LAURIE R. (2012) On Determining Whether Artillery Fire Was Directed at Civilians Purposefully: Criticism of the ICTY’s Gotovina Decision. Lawfare: Hard National Security Choices. Available at www.lawfareblog.com/2012/01/gotovina-and-distinction/ (Accessed May 30, 2013). BUSH, GEORGE H. W. (1990) Address Before a Joint Session of the Congress on the Persian Gulf Crisis and the Federal Budget Deficit. Washington. Available at bushlibrary.tamu. edu/research/public_papers.php?id=2217&year=1990&month=9 (Accessed May 30, 2013). DORN, A. WALTER. (2011) The Just War Index: Comparing Warfighting and Counterinsurgency in Afghanistan. Journal of Military Ethics 10: 242–262. ELSEA, JENNIFER K., AND RICHARD F. GRIMMETT. (2011) Declarations of War and Authorizations for the Use of Military Force: Historical, Background and Legal Implications. Washington: Congressional Research Service. CRS Report for Congress RL31133. Available at www.fas.org/ sgp/crs/natsec/RL31133.pdf (Accessed May 29, 2013). ENEMARK, CHRISTIAN, AND CHRISTOPHER MICHAELSEN. (2005) Just War Doctrine and the Invasion of Iraq. Australian Journal of Politics & History 51: 545–563. FALK, RICHARD. (2004) Legality to Legitimacy: The Revival of the Just War Framework. Harvard International Review 26: 40–44. GARDAM, JUDITH GAIL. (1993) Proportionality and Force in International Law. American Journal of International Law 87: 391–413. GRAY, CHRISTINE D. (2004) International Law and the Use of Force, 2nd edition. Oxford: Oxford University Press. GRIECO, JOSEPH M., CHRISTOPHER GELPI, JASON REIFLER, AND PETER D. FEAVER. (2011) Let’s Get a Second Opinion: International Institutions and American Public Support for War. International Studies Quarterly 55: 563–583. GRIMMETT, RICHARD F. (2011) 34 Instances of Use of United States Armed Forces Abroad, 1798–2010. Washington: Congressional Research Service. CRS Report for Congress R41677. Available at www.fas.org/sgp/crs/natsec/R41677.pdf (Accessed May 29, 2013). HALL, ROBIN. (1993) How Children Think and Feel About War and Peace: An Australian Study. Journal of Peace Research 30: 181–196. HOLSTI, OLE R. (2004) Public Opinion and American Foreign Policy, Revised edition. Ann Arbor: University of Michigan Press. JOHNSON, JAMES TURNER. (1999) Morality and Contemporary Warfare. New Haven: Yale University Press. LARSON, ERIC V., AND BOGDAN SAVYCH. (2005) American Public Support for U.S. Military Operations from Mogadishu to Baghdad. Santa Monica: RAND Corporation. Available at www.rand.org/pubs/ monographs/MG231.html (Accessed May 30, 2013). OBAMA, BARACK H. (2009) The Nobel Lecture. Oslo. Available at http://nobelpeaceprize.org/en_GB/laureates/laureates-2009/obama-lecture/ (Accessed May 30, 2013). PRADOS, ALFRED B. (2003) Iraq: Divergent Views on Military Action. Washington: Congressional Research Service. CRS Report for Congress RS21325. Available at www.fas.org/man/crs/RS21325.pdf (Accessed May 29, 2013). REICHBERG, GREGORY M., HENRIK SYSE, AND ENDRE BEGBY, EDS. (2006) The Ethics of War: Classic and Contemporary Readings. Oxford: Blackwell Publishers. SCHWARTZ, SHALOM H. (1992) Universals in the Content and Structure of Values: Theoretical Advances and Empirical Tests in 20 Countries. In Advances in Experimental Social Psychology, edited by Mark P. Zanna. San Diego: Emerald Publishing. SCHWARTZ, SHALOM H. (1994) Are There Universal Aspects in the Structure and Contents of Human Values? Journal of Social Issues 50: 19–45. STAHN, CARSTEN, AND JANN K. KLEFFNER, EDS. (2008) Jus Post Bellum: Towards a Law of Transition from Conflict to Peace. The Hague: T. M. C. Asser Press. TORREON, BARBARA SALAZAR. (2012) US Periods of War and Dates of Current Conflicts. Washington, DC: Congressional Research Service. CRS Report for Congress RS21405. Available at www.fas.org/ sgp/crs/natsec/RS21405.pdf (Accessed May 29, 2013). UNITED NATIONS SECURITY COUNCIL. (2001) United Nations Security Council Resolution 1368 (2001). Available at www.undocs.org/s/res/1368(2001) (Accessed May 29, 2013). UNITED NATIONS SECURITY COUNCIL. (2003) United Nations Security Council Resolution 1510 (2003). Available at www.undocs.org/s/res/1510(2003) (Accessed May 29, 2013). WALZER, MICHAEL. (2000) Just and Unjust Wars: A Moral Argument with Historical Illustrations, 3rd edition. New York: Basic Books. 3 See, for example, briefs filed at the International Criminal Tribunal for the Former Yugoslavia concerning the use of artillery attacks in 1995 (Blank 2012). 4 They focused mostly on just cause and right authority, but also “completed the Just War assessment” with smaller sections on: right intention, reasonable prospect of success, proportionate cause, and war as a last resort (Enemark and Michaelsen 2005). 5 A search through the literature found various surveys about attitudes toward war (Asmus, Everts, and Isernia 2004; Holsti 2004; Larson and Savych 2005; Berinsky 2009; Grieco et al. 2011), but none used just war criteria to evaluate specific wars. 6 We also examined the political center but those results are not included in this paper in order to simplify the analysis. 7 In one case, a survey was discarded because it displayed an undifferentiated pattern of responses. It assigned the same rating to all conflicts for a given criterion using one large circle for each of several pages. 8 Major US combat operations that received widespread attention are included, that is, all those listed in Torreon (2012), although more comprehensive listings are available (Elsea and Grimmett 2011; Grimmett 2011). US operations in Somalia (1991–93) were not included as there is significant confusion between the closely connected UN peacekeeping operations at the same time. 9 The survey also included questions on Canadian conflicts fought since 1900, in addition to the American conflicts discussed here. Those results are to be published separately. 11 The nationalities of respondents were not sufficiently widespread to track global views. Mostly, they were American (49%) and Canadian (35%). The differences between these two nationalities were small: the Canadians gave higher JWI scores (1.05) than Americans (0.75), averaging across all the conflicts.